Contract Assay Services (CAS) is a contract research organization (CRO) established within STEMCELL Technologies that performs assay services based on in vitro and in vivo primary stem cell assays. When used in in vitro assays, primary cells are thought to be more representative of in vivo functionality than cell lines. We specialize in providing the in vitro hematopoietic colony-forming unit (CFU) assay (also known as the colony-forming cell (CFC) assay). We also perform mesenchymal, immunological and custom cell-based assays for efficacy and toxicity studies. Watch the video to learn more about CAS at STEMCELL Technologies—how we began, what we’ve done and where we can go with you. Contact us at contractassay@stemcell.com to find out how we can help you meet your goals. Preparation of a proposal that clearly defines project scope, timeline and cost. Experimental execution and data analysis. We combine the power of specialized STEMCELL Technologies media and reagents with the practical knowledge of our scientists to provide both standardized and customized assay services. You can choose from a portfolio of characterized assays using pre-qualified primary stem cells or discuss your individual needs with our in-house experts. Since 2000, Contract Assay Services has performed such studies for over 120 pharmaceutical, biotechnology, government and academic life science organizations worldwide. We provide exceptional service through frequent communication, quality products and extensive expertise. Why Use Contract Assay Services? TRUSTED FOR QUALITY. Our high standards for methods, materials, processes and customer communication are evident in the loyalty of our returning clientele. OPEN COMMUNICATION. As your eyes and ears in the lab, we place a priority on communication with our clients throughout the study process. ISO-CERTIFIED. STEMCELL Technologies is a world leader in the development of industry-standard products for stem, progenitor and other primary cells. EXTENSIVE EXPERTISE. We work directly with the scientists who develop the specialized STEMCELL products used in our assays. 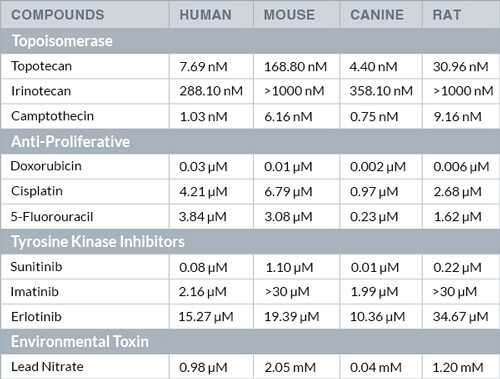 Toxicity is a major cause of attrition in therapeutic drug development and a key consideration when selecting candidate drugs for advancement through the development pipeline. Expanding preclinical testing to incorporate assays that are better at predicting potential toxicities earlier in the development process has obvious advantages for the selection of successful lead candidates. In vitro testing on primary cells can allow investigators to preview in vivo responses, thus facilitating design of better dosing strategies and optimization of animal models in preclinical testing, as well as Phase I clinical trials. We specialize in performing in vitro assays on hematopoietic stem and progenitor cells to measure the potential toxic effects of candidate therapeutics, including small molecule compounds and biologics. Mesenchymal stem and progenitor cells, which generate key components of bone, fat and cartilage, may also be tested in the colony-forming unit - fibroblast (CFU-F) assay to predict possible cytotoxic effects. Mouse intestinal organoids can also be used to assess the effects of candidate therapeutics on cellular viability. Contact us at contractassay@stemcell.com for a more in-depth discussion on how each of the assays in the sections below can be modified to meet your specific goals. We can assess the hematotoxicity of candidate therapeutics on erythroid, myeloid, and megakaryocyte progenitors using standardized and custom-designed colony-forming unit (CFU) assays (also known as the colony-forming cell (CFC) assay). Pessina A et al. (2003) Application of the CFU-GM Assay to Predict Acute Drug-Induced Neutropenia: An International Blind Trial to Validate a Prediction Model for the Maximum Tolerated Dose (MTD) of Myelosuppressive Xenobiotics. Toxicological sciences 75(2) 355-367. Pessina A et al. (2009) Application of human CFU-Mk assay to predict potential thrombocytoxicity of drugs. Toxicol In Vitro 23(1) 194-200. 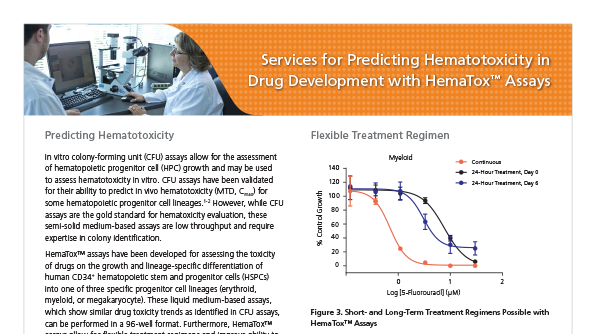 HemaTox™assays can assess the toxicity of drugs on the growth and lineage-specific differentiation of human CD34+ hematopoietic stem and progenitor cells (HSPCs) into one of three specific progenitor cell lineages (erythroid, myeloid, or megakaryocyte). CD34+ cells were exposed to 5-Fluorouracil continuously for the entire duration of the culture (red, continuous), transiently for 24 hours on day 0 followed by washout of the drug (black, 24-Hour treatment, day 0), and transiently for 24 hours on day 6 (blue, 24-Hour treatment, day 6), when committed myeloid progenitors were already present. Data is presented as average growth, as a percentage of control, obtained from triplicate culture wells derived from a single representative donor. Error bars represent standard deviation. Azidothymidine (AZT) is an antiviral nucleoside analog that targets viral polymerases but can also inhibit cellular polymerases, leading to decreased cell proliferation and ultimately the suppression of hematopoiesis, resulting in anemia and neutropenia. Traditional CFU assays primarily quantitate the effects of a drug on colony numbers and not effects on colony size that may result from inhibited cell proliferation. The inability to quantify changes in colony size may explain why AZT, well known to perturb hematopoiesis in patients, does not exhibit high toxicity in CFU assays. 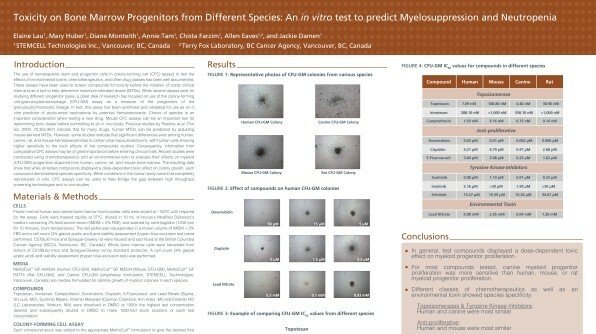 In contrast, HemaTox™ assays can detect changes in both cell differentiation, by assessing the expression of cell surface markers used to distinguish between specific cell populations, and cell proliferation, by absolute cell counts. Shown are erythroid (BFU-E) colonies at 10X magnification in a CFU assay after 14 days of culture in the absence and increasing presence of AZT. Representative dose-response curves for AZT based on colony numbers (black, CFU) and lineage-specific cell numbers (red, HemaTox™). The table shows the average IC50 values from three to five multiple donor lots and four to seven independent experiments. 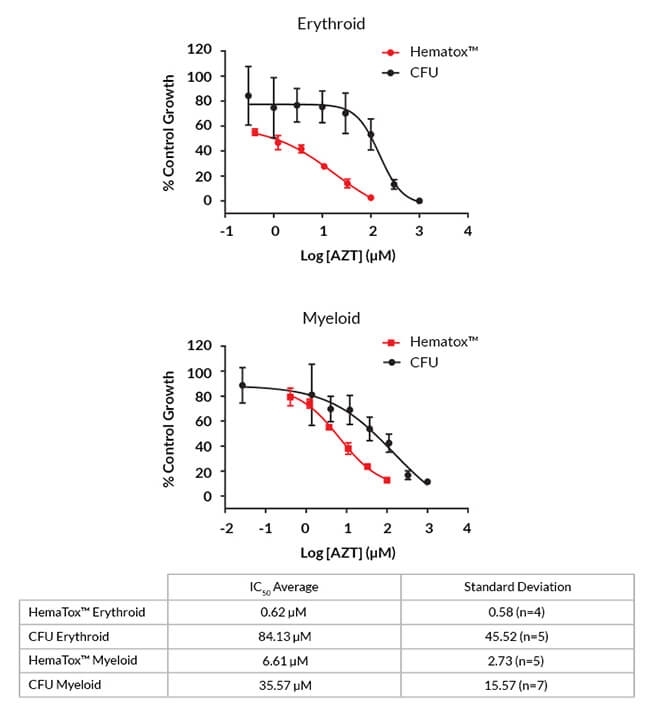 Dose-response curves were generated from titrations of 5-Fluorouracil added to human CD34+ cells from five to seven donor lots in HemaTox™ (A) Myeloid, (B) Erythroid and (C) Megakaryocyte assays. In each assay, similar IC50 values were obtained with cells from different donors and in different experiments with cells from the same donor. Shown are values (% of control growth) normalized to the number of cells in the solvent control cultures. Mesenchymal stem cells (MSCs), under the appropriate conditions, can differentiate into cells that make up adipose tissue, cartilage, bone and muscle. Using the colony-forming cell-fibroblast (CFU-F) assay, drug candidates destined for the tissue engineering market can be assessed for stimulatory or inhibitory effects on mesenchymal stem and progenitor cells, as well as for effects on the differentiation potential of these cells. The effects of compounds on colony size and density can also be evaluated. Shown are Colony-Forming Unit - Fibroblast (CFU-F) assays containing MSCs plated (A) in the absence and (B) in the presence of an inhibitory compound. Notable differences in morphology include fewer cells and a more scattered distribution in the culture containing (B) the inhibitory compound. Colony numbers are also reduced in the presence of an inhibitory compound (data not shown). The physiological relevance of cell-based assays can potentially be increased through the use of 3D culture systems, bridging the gap between high-throughput in vitro screening methods and large in vivo studies during drug development.1,2 Organoids generated from the intestinal epithelium recapitulate numerous features of the adult intestine in vivo, including self-renewal and differentiation pathways, cell types present and cellular organization within the epithelium. Together these characteristics create a culture system that is a powerful tool for investigating the potential toxicity of candidate therapeutics to the intestinal epithelium. Contract Assay Services offers an in vitro mouse intestinal organoid-based assay to assess the effect of candidate therapeutics on cell viability via measurement of intracellular ATP. Read more about Development of a 96-well Assay for Assessing Cell Viability in Mouse Small Intestinal-Derived Organoids After Treatment with Cytotoxic Compounds. Ranga A et al. (2014) Drug discovery through stem cell-based organoid models. Adv Drug Deliv Rev 69-70 19-28. Sato T, Clevers H. (2013) Growing self-organizing mini-guts from a single intestinal stem cell: mechanism and applications. Science 340(6137) 1190-1194. CAS can evaluate preclinical test compounds and biologics for their abilities to modulate the immune system. We offer customized cell-based assays based on the needs of each client and can assist clients in designing studies to evaluate the effects of potential immunomodulatory agents using fresh or frozen cell samples. Explore our immunological tools and assay systems below and contact us at contractassay@stemcell.com to learn more about how we can help answer your immunological questions. Multicolor flow cytometry can identify and enumerate different subsets of immune cells in a heterogeneous cell population. Immune cells such as human PBMCs and T cells (from normal or diseased patients) can be stimulated in in vitro culture. The immunomodulatory effects of test compounds on specific cell subsets in culture can be assessed by monitoring cell proliferation, surface marker expression and viability. Human peripheral blood mononuclear cells (PBMCs) were stimulated with different concentrations of ImmunoCult™ Human CD3/CD28 T Cell Activator (Catalog # 10971) for 5 days. 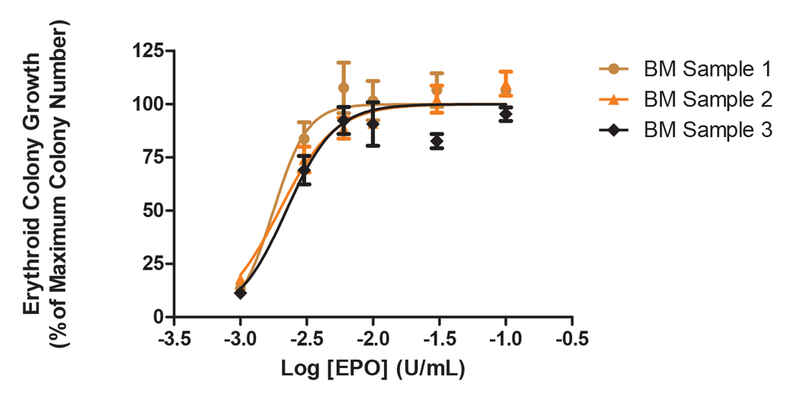 PBMCs were labelled with cell tracking dye, and viability was measured by gating on 7-AAD (viability dye) negative cells. Cell division and proliferation were measured by flow cytometric analysis. Each peak represents a cell division. Cytokine expression can be quantified by flow cytometry, ELISA or Meso Scale Discovery multiplex array. Activated human T cells (gated on CD4+ and CD8+ populations) were analyzed by intracellular flow cytometry for IFN-γ and TNF-α expression. After the cells were fixed and permeabilized, antibodies against the cytokine of interest were added to the cell suspension, followed by flow cytometry. ©2013 Meso Scale Discovery a division of Meso Scale Diagnostics, LLC. All rights reserved. Schematic representation of Meso Scale Discovery multiplex platform. STEMCELL’s Contract Assay Services (CAS) group is a certified CRO partner of Meso Scale Discovery. Regulatory T (Treg) cells suppress exuberant immune activation and promote immunological tolerance. Our T cell suppression assay can evaluate the immunomodulatory effect of pre-clinical test compounds and biologics on Treg cell function. 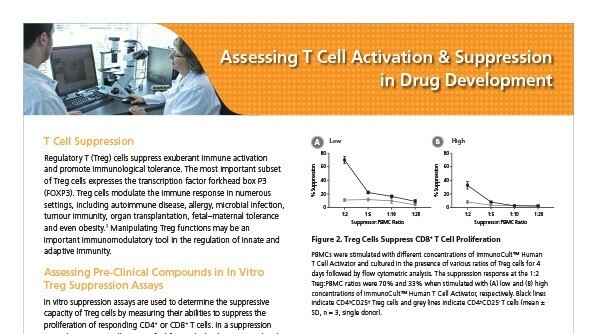 Read more about assessing T cell activation and suppression in drug development. Fresh Treg cells and PBMCs were purified from a healthy donor. Treg cells and PBMCs were co-cultured in the presence of a solvent, an immunomodulatory compound, or a negative control article and then activated for 4 days with ImmunoCult™ Human CD3/CD28 T Cell Activator in ImmunoCult™-XF T Cell Expansion Medium. 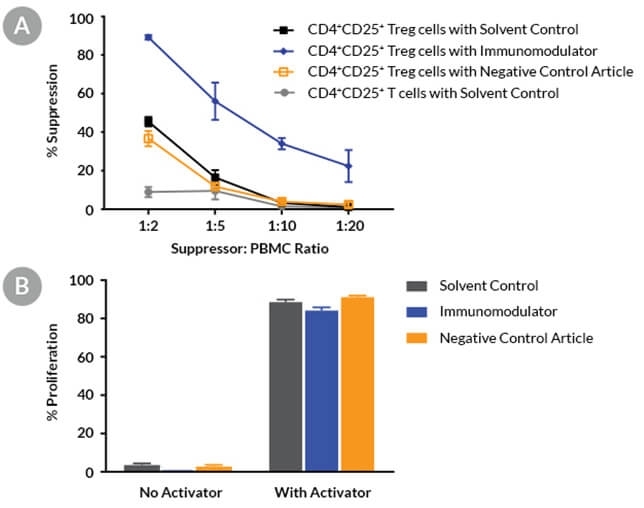 (A) The suppression response at the 1:2 Treg:PBMC ratio was 45% for the solvent control, 37% for the negative control article and 89% for the immunomodulator. Co-culturing with conventional CD4+CD25- T cells showed < 10% of the suppression response (mean ± SD, n = 3, single donor). (B) Control experiments demonstrating the proliferation of responder cells in the absence of Treg cells are shown. Cells were cultured in conditions as described above. The immunomodulator alone had a minimal effect on responder cell proliferation (mean ± SD, n = 3, a representative single donor). We can help evaluate the effect of test compounds and biologics on macrophage and dendritic differentiation and maturation using our ImmunoCult™ product lines. The mature differentiated cultures can be phenotypically assessed by flow cytometry. Standardized and customized formulations are available. Biopharmaceutical drugs, also known as biologics, have become an essential part of modern pharmacotherapy and include examples such as biological proteins, cytokines, hormones, monoclonal antibodies, vaccines, and cell- and tissue-based therapies. Biopharmaceuticals may include compounds such as biosimilars, molecules meant to be an improved version of a previously developed drug on which the patent has expired. The hematopoietic colony-forming cell (CFC) or colony-forming unit (CFU) assay can be used to test the activity of biopharmaceutical cytokines. Hematopoietic progenitors are isolated from human bone marrow, and plated in a CFU assay to observe the direct stimulatory effects of test articles on progenitor growth and morphology. The effects of these cytokines can be similarly evaluated in animal models. For example, the data below show the effects of erythropoietin (EPO) measured in vitro (Figure 1, Table 1) and in vivo (Figure 2, Table 2), and of granulocyte-stimulating factor (G-CSF) (Figure 3). Hematopoietic progenitors are isolated from human bone marrow, and plated in a CFU assay to observe the direct stimulatory effects of test articles on progenitor growth and morphology. The effects of these cytokines can also be evaluated in animal models. 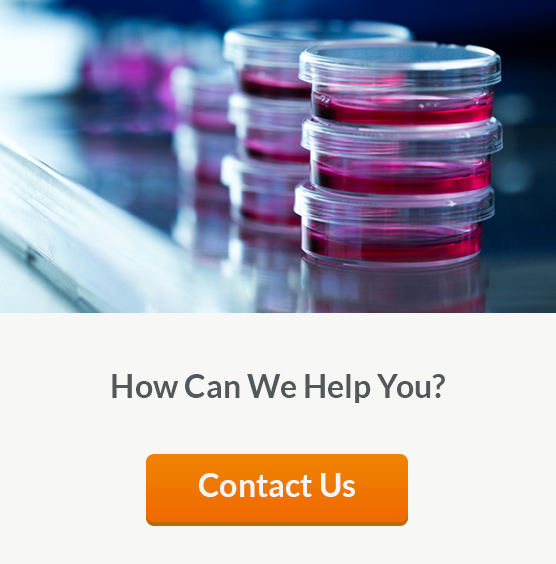 Contact us at contractassay@stemcell.com to learn more about how you can employ the CFU assay in your organization. 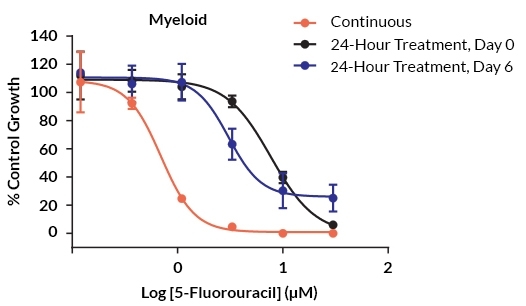 Human bone marrow mononuclear cells were isolated from three individual patients and plated in CFU assays using MethoCult™ medium, in the presence of decreasing concentrations of control erythropoietin (EPO). The percentage of erythroid colonies in samples treated with decreasing concentrations of EPO-based biosimilars can be compared to the number of colonies supported by an optimal concentration of Control EPO as determined by this graph and Table 1 below. 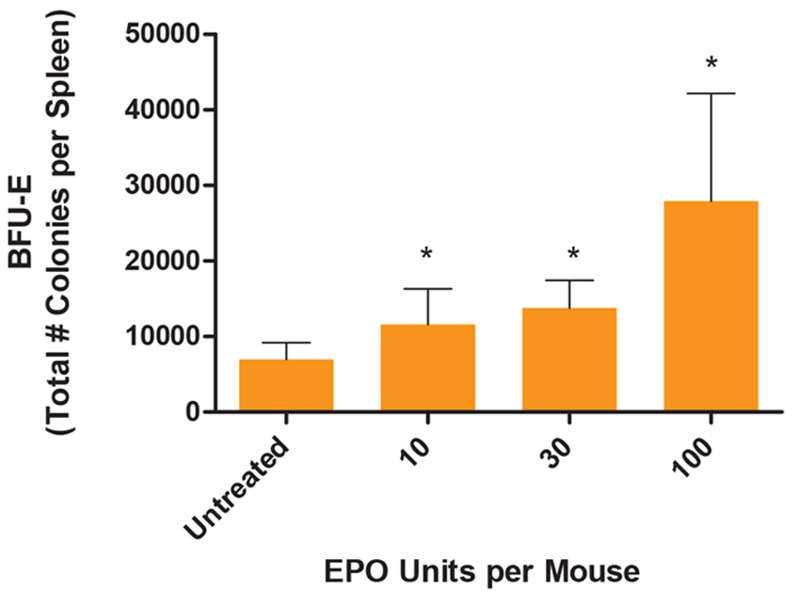 Wild type BDF1 mice were treated with EPO on days 0 and 1. 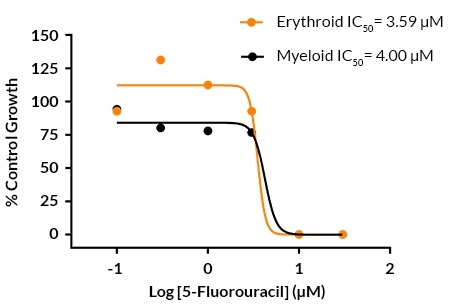 On day 4 the mice were sacrificed and the progenitor content of the spleens was assessed by plating cells in a CFU assay and counting the number of erythroid (BFU-E) progenitors per spleen. The percentage of reticulocytes were also measured by flow cytometry (Table 2). C3H/HeN mice were treated with 5 µg rhG-CSF per day on days 0 - 2. Eighteen hours after the last G-CSF injection mice were sacrificed and the peripheral blood (PB) was collected. The progenitor content of in the PB of each mouse was then assessed in a CFU assay. 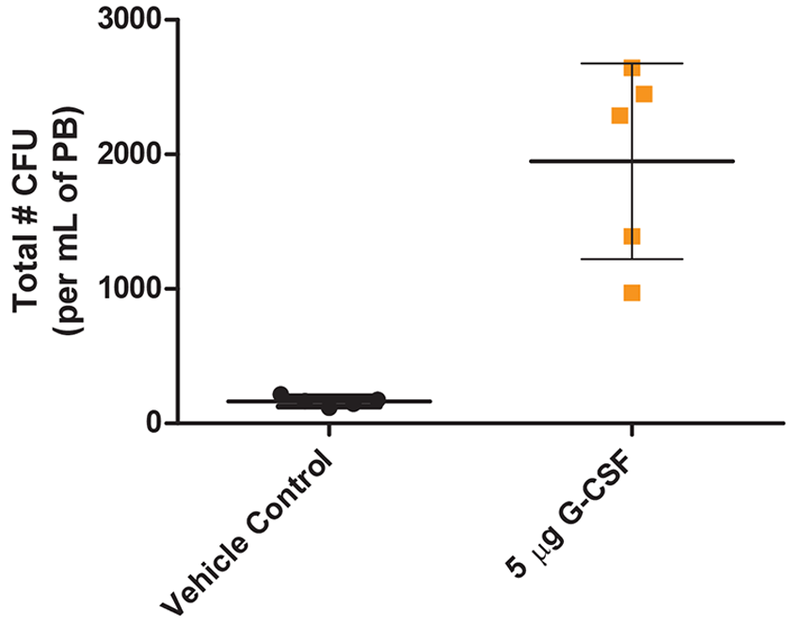 Mice treated with G-CSF showed a 10-fold increase in the number of CFUs per mL of PB when compared to vehicle control. Stem cells are rare cells that may be phenotypically identified by the expression of cell surface markers. The identification of hematopoietic stem and progenitor cells (HSPCs) and mesenchymal stem cells (MSCs) is the result of years of scientific research showing that phenotypically-identified populations of cells maintain corresponding functions. Functional assays are the most stringent test of a stem cell’s identity and are key in understanding the effect of genes, biochemical pathways and candidate therapeutics. Contract Assay Services can provide both phenotypic and functional assessments of your stem cell population of interest. Our scientists are experienced in designing and performing studies to evaluate the effects of novel test articles on the expansion and differentiation capacity of stem cells. 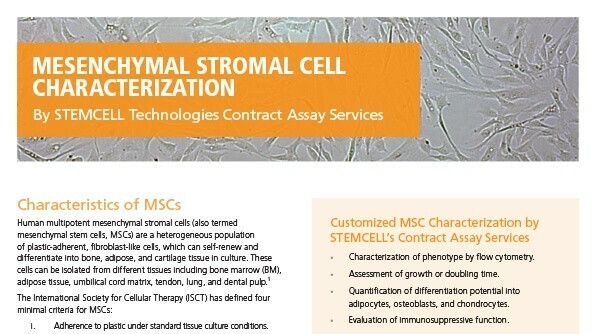 Contact us at contractassay@stemcell.com to learn how to take advantage of our stem cell characterization services and assays described below. C3H/HeN mice were treated with 5 µg rhG-CSF per day on days 0 - 2. Sixteen hours after the last G-CSF injection, one group of 5 mice was treated with 5 mg/mL of AMD3100 (also know as Mozobil or Plerixafor). Ninety minutes after treatment with AMD3100, mice were sacrificed and peripheral blood (PB) was collected. The progenitor content in the PB of each mouse was then assessed using the CFU assay. 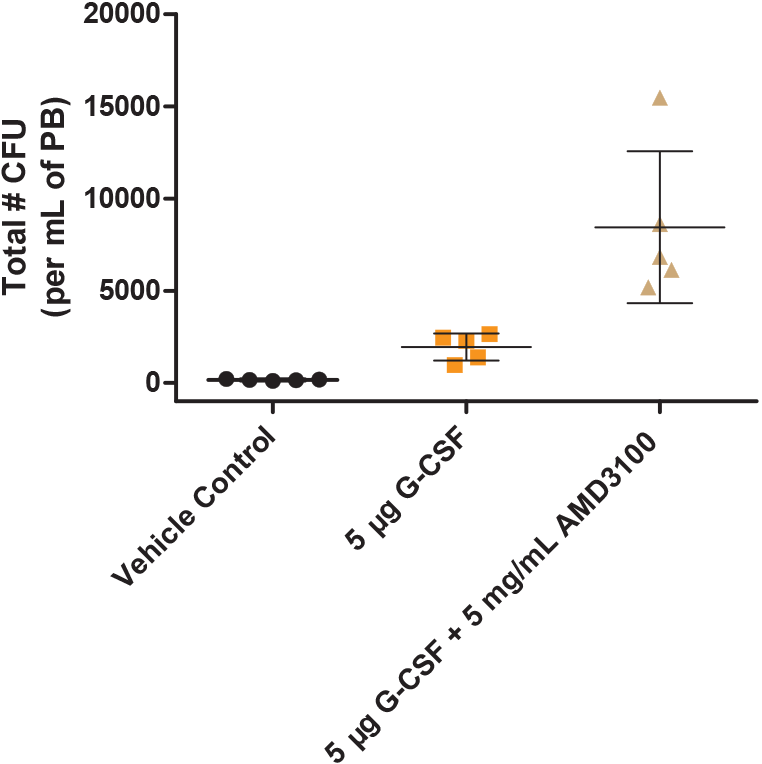 Mice treated with rhG-CSF alone showed a 10-fold increase in the number of CFUs per mL of PB, and mice treated with rhG-CSF and AMD3100 showed a 50-fold increase in the number of CFUs per mL of PB, when compared with vehicle control. 1. Szilvassy SJ et al. (2002) Quantitation of Murine and Human Hematopoietic Stem Cells by Limiting-Dilution Analysis in Competitively Repopulated Hosts. In: Klug CA & Jordan CT (Eds. ), Methods in Molecular Medicine: Hematopoietic Stem Cell Protocols (pp. 167-187). Totowa, NJ: Humana Press. 2. Miller CL & Eaves CJ. (2002) Long-Term Culture-Initiating Cell Assays for Human and Murine Cultures. In: Klug CA & Jordon CT (Eds. ), Methods in Molecular Medicine: Hematopoietic Stem Cell Protocols (pp. 123-141). Totowa, NJ: Humana Press. 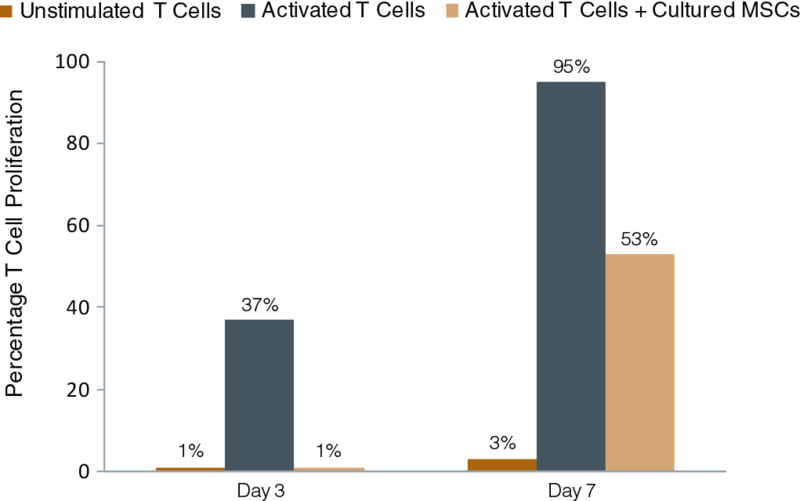 Using co-culture experiments and the CFSE dye dilution assay, we can show that passage 2 MSCs can suppress division of activated T cells at both day 3 and day 7 of culture. STEMCELL Technologies is a world leader in providing products for stem cell research. We offer products and services for hematopoietic, mesenchymal and neural stem cell culture as well as embryonic stem (ES) cells and induced pluripotent stem (iPS) cells.